Large corporations, major MBA programs, business owners and Wall Street investors agree: organizations pursuing sustainability have better performance. The Sustainability Alliance recognizes organizations that do the most for their employees, the community and the environment through our Sustainable Business Certification. We also encourage Sustainable Entrepreneurship in kids in the hopes of building more local, sustainable businesses through our Sustainable Entrepreneurship Microloan for Schools program. Learn more about the power of sustainability to help business on this page. If you're on this website, you must care about sustainability. So why not use your wallet to reward organizations that share your values? The Sustainability Alliance's Sustainable Business Certification helps you easily identify sustainable businesses community services, food and drink, entertainment, lodging, retailers, etc. Here's a list of who's certified by type. Click here to download a PDF or scroll. Get Certified as a Sustainable Business! The Sustainable Business Certification recognizes and drives business toward those organizations that do the most for their employees, our community and the environment. It's not just for business. Schools, non-profits and even municipalities have gotten certified. Do you believe organization can be a force for good in the world? Does your organization provide a positive impact on employees, the community and the environment? If yes, you likely can qualify for one of our certification levels. Planning an event? Make it zero waste! One of the best ways to make an event more sustainable is to focus on reducing waste. 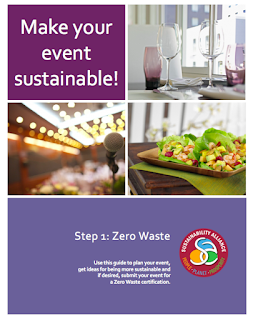 Click here to download Make Your Event Sustainable which includes a zero waste event checklist. If you can commit to the 16 Zero Waste Event Practices, the Alliance can certify your event which will help you publicize your efforts and educate everyone who attends. Business Case Spreadsheet: Not sure how sustainability could help your organization be more competitive? Click here to get Bob Willard's Sustainability ROI Workbook free. It will help you make a business case for pursuing sustainability. For social entrepreneurs: Three new tools developed with funding by Lemelson Foundation called Sustaining our Planet: A Toolkit for Entrepreneurs.